After half the votes have been counted, some 95.5% of voters in Crimea have supported joining Russia in a disputed referendum, officials announce. Crimea’s leader Sergei Aksyonov says he will apply to join Russia on Monday. Russian President Vladimir Putin has said he will respect the Crimean people’s wishes. 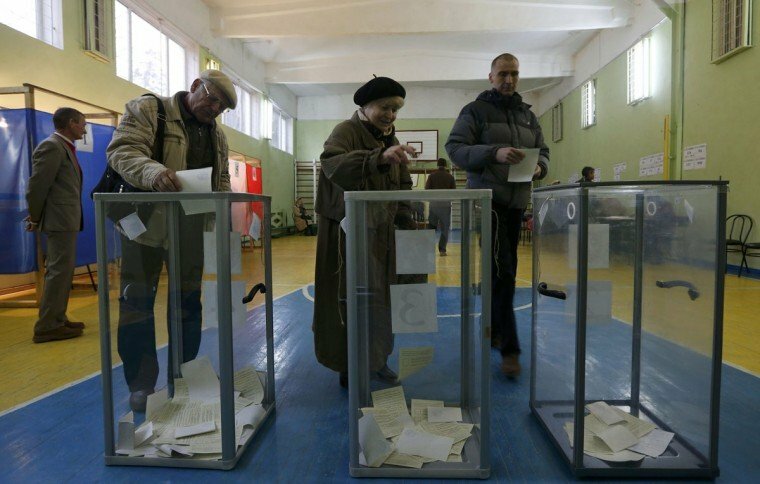 Many Crimeans loyal to Kiev boycotted the referendum, and the EU and US condemned it as illegal. Pro-Russian forces took control of Crimea in February. They moved in after Ukraine’s pro-Moscow president was ousted by street protests. The Kremlin said President Vladimir Putin and US President Barack Obama had spoken over the phone and agreed to seek a way to stabilize Ukraine. Shortly after polling stations closed, however, the US renewed its threat to put sanctions on Russia. White House spokesman Jay Carney condemned the vote as “dangerous and destabilizing” and said it would have “increasing costs for Russia”. The EU said in a statement that the vote was “illegal and illegitimate and its outcome will not be recognized”. EU foreign ministers are due to meet on Monday and are expected to consider imposing sanctions on Russian officials.